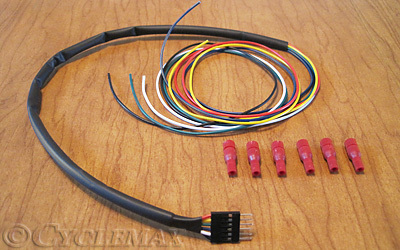 This kit contains 6 signal wires, 6 Posi-tap adaptors and 1 connector, needed to hook up your Rollin' Eyes controller to your vehicle. By connecting the wires to existing signal lights, the controller is forced into "Street Mode", to make it a legal light while driving on public road. The wires have the same color code as the wires at the controller. Cable length = 36 " (90 centimeter). Posi-tap are very easy to "tap" into other wires, as shown in the pictures. Strips and rings have a 3 pin connector. It fits into the Rollin' Eyes controller or to our extension cables. Route the extension cables from each strip to the controller and click it in one of the free connectors.